When Hayden first met Sheila, she refused to speak, her only communication coming through bursts of destructive, violent behavior. After five intense months, Hayden successfully broke through to Sheila, and successfully fought to have her placed in a regular classroom. Hayden did not see Sheila again until she was 13. Much to Hayden's astonishment, Sheila remembered little about their extraordinary time together. As Hayden continues to renew her relationship with the teenage Sheila, the memories slowly come back, bringing with them feelings of abandonment and hostility. 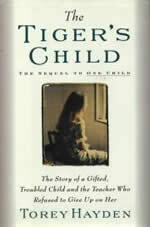 THE TIGER'S CHILD may sound somewhat dark because Sheila's life definitely wasn't light and breezy. However, it is surprisingly uplifting, because Sheila's story is one of perseverance. Each page leaves the reader wondering what will happen next and hoping for the best for both Sheila and Hayden. Torey didn't want to write a sequel to ONE CHILD initially. When ONE CHILD was published, her editor thought Sheila's life after leaving Torey's classroom was so grim that it would be better not to say anything about it. Torey also felt it would be hard to follow up ONE CHILD because ONE CHILD had been "something of a fairy tale" and had left the reader with the impression of "happily ever after". A sequel would make "real life all too apparent". In the end she wrote THE TIGER'S CHILD on a dare from Sheila, who had teasingly said she never would. "likes THE TIGER'S CHILD better, because you might as well be honest." Jeff is now in his fifties. He still lives in California and continues his work as a psychiatrist. Thanks to everyone who is interested in what became of me. Torey and I had some spectacularly exciting times together. Lots of fun. Lots of laughs. Torey's sense of humor transformed those years for me. I've had fulfilling, meaningful years since but I've still never laughed as much. I've had a pretty good life. I'm in a long-term relationship with my partner, Bill, and we have a 10-year-old adopted son, Charles. I have moved, career-wise, to working with people suffering from sociopathic and severe psychotic disorders. It is demanding work but very gratifying. I hope everyone enjoys Torey's web site I've read through it and it makes me feel just like I'm back there with her. Believe me, Torey writes just like she speaks, so this is pure Torey. Enjoy!